Few figures in the history of Western civilization can evoke the sort of reactions-both positive and negative-that John Calvin does five hundred years after his birth. His most ardent admirers have frequently betrayed him, and his friends have been as damaging to his reputation as his enemies. Much has been attributed to him that he would have disowned in a heartbeat. And yet, as Victor Shepherd perceptively observes in this booklet, to read his correspondence is to come close to someone whose heart breaks over the grief of people wracked by tragedy, illness, treachery, and untimely death. Everywhere Calvin evinces first-person acquaintance with a holy God whose mercy he wants to attest at all times and in all circumstances. 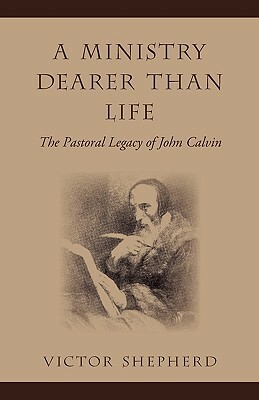 In "A Ministry Dearer Than Life, " Victor Shepherd reminds us that despite the popular caricature of Calvin as cold-hearted dogmatist, Calvin was above all else a pastor whose biblical and theological expositions throb with empathic warmth. In doing so, Dr. Shepherd reminds the church today that Calvin still has much to teach us about pastoral ministry in the twenty-first century. The Rev. Dr. Victor Shepherd is Professor of Systematic and Historical Theology at Tyndale University College & Seminary, Toronto, and Professor "Ordinarius" for the Graduate Theological Foundation, University of Oxford. He is also an adjunct professor at the Toronto School of Theology, University of Toronto, where he supervises doctoral students in Reformation studies. His other books include, "Interpreting Martin Luther: An Introduction to His Life and Thought" and "The Nature and Function of Faith in the Theology of John Calvin. "